A paper like this does a good job of showing just how bad the situation can be - experimentally driving router buffering delay from 10ms to ~1000ms on many common broadband cable and DSL modems. I wish the paper had been able to show me the range and frequency of that queue delay under normal conditions. I'm concerned that decreasing the router buffer size, thereby increasing the drop rate, is detrimental to the current HTTP/1.x web. A classic HTTP/1.x flow is pretty short - giving it a signal to backoff doesn't save you much - it has sent much of what it needs to send already anyhow. Unless you drop almost all of that flow from your buffers you haven't achieved much. Further, a loss event has a high chance of damaging the flow more seriously than you intended - dropping a SYN or the last packet of the data train is a packet that will have very slow retry timers, and short flows are comprised of high percentages of these kinds of packets. non-drop based loss notification like connex/ecn do less damage but are ineffective again because the short flow is more or less complete when the notification arrives so it cannot adapt the sending rate. The problem is all of those other parallel HTTP sessions going on that didn't get the message. Its the aggregate that causes the buffer build up. Many sites commonly use 60-90 separate uncoordinated TCP flows just to load one page. Making web transport more adaptable on this front is a big goal of my spdy work. When spdy consolidates resources onto the same tcp flow it means the remaining larger flows will be much more tcp friendly. Loss indicators will have a fighting chance of hitting the flow that can still backoff, and we won't have windows growing independently of each other. (Do you like the sound of IW=10 times 90? That's what 90 uncorrelated flows mean. IW=10 of a small number of flows otoh is excellent.). That ought to keep router queue sizes down and give things like rtcweb a fighting chance. It also opens up the possibility of the browser identifying queue growth through delay based analysis and possibly helping the situation out by managing inside the browser our bulk tcp download rate (and definitely the upload rate) by munging the rwin or something like that. 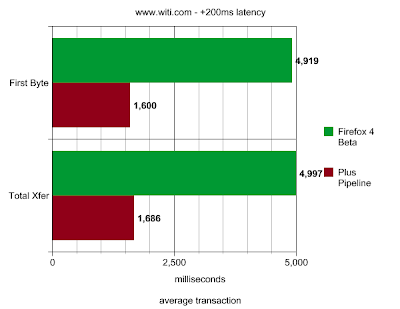 If it goes right it really shouldn't hurt throughput while giving better latency to other applications. It's all very pie in the sky and down the road, but its kind of hard to imagine in the current HTTP/1.x world. codebits is full of vitality. Portugal is lucky to have it. I've made a living dealing with fast networks and servers that run at really impressive transaction rates using all manner of nifty interconnects and parallelism. Sometimes I forget that the day to day web isn't all that fast in comparison. This isn't scientific. It is where I happen to browse, and its just one datapoint although I can tell you my gut says it is pretty typical output - gathered over 15,000 connections. 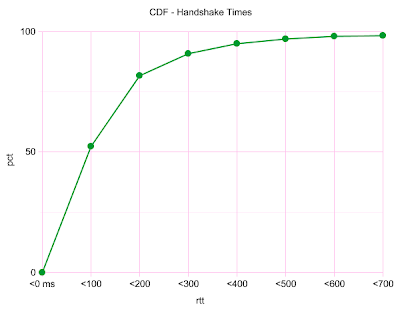 Only about half of my handshakes are where I want them to be: < 100ms. Most of the rest fall in the next 300ms. To be fair there is a little skew in here because the code doesn't separate https from http, and SSL has an extra RTT in there. But SSL is a small fraction of the overall sample. And this is the desktop. Think mobile and wireless. Every once in a while I'm still surprised at the potential upside of pipelines. I stumbled across a great example recently: Women In Technology International. That home page is setup in a pretty typical newsletter format. It has 159 resources, 145 of which are images along with about a half dozen pieces of js and css. Most of the images are small, with over 2/3 of them loading in less than 20ms of transfer time (time to first byte removed). What is striking about this page is how large of an advantage pipelining can give even on a well connected broadband desktop with a 100ms RTT to the witi hosting facility. The average latency to receive the first byte of a resource dropped from 1697ms to 626ms, and the average elapsed time per transaction overall dropped from 1719ms to 652ms. Aggregate that over 159 different resources and you have some serious gains! That's right - 3300ms of improvement on each transaction! That seems absurdly good if we only added 200ms of latency, but what you're seeing is the aggregate queueing effect - Firefox wants 150 resources more or less simultaneously and can only parallelize it on 6 connections. If you are 25 positions deep on that queue you will have to wait at least 7500ms just for the back and forth of each transaction in front of you to complete.. obviously not everyone is queued that deeply so the average effect is somewhat less, but still overwhelming. 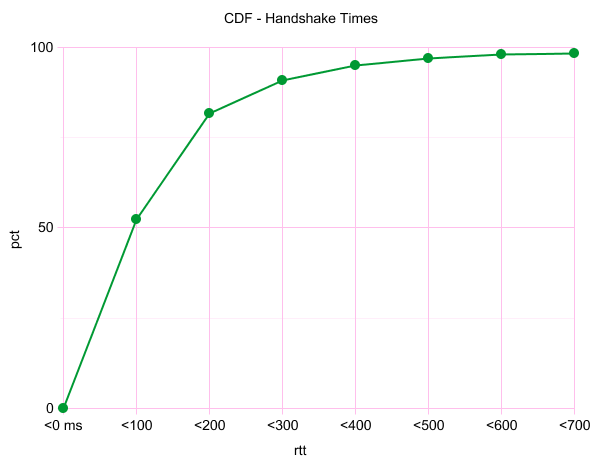 It hides network idleness during TCP Handshakes though persistent connections help with this too. It hides network idleness during the first byte phase transactions, though pipelining can address this too. It hides network idleness during TCP slow start wait-for-ack periods. This is a big one. It provides a mechanism to prioritize and avoid head of line blocking problems. It steals bandwidth from competing "tcp friendly" flows by simply increasing the number of flows in one application. That's an arms race that most people think should be avoided. It increases the number of TCP Handshakes which are both slow and CPU intensive (at least compared to regular data packets) to execute - this assumes persistent connections are an alternative. It increases the impact of memory overhead and processor cache pollution by increasing the number of simultaneous TCP control blocks that have to managed on both the client and the server. 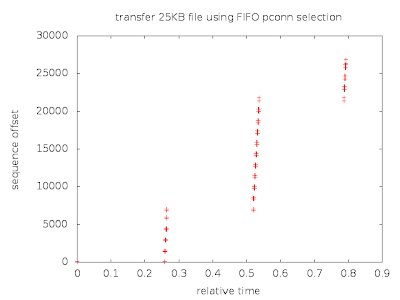 The resulting reduced amount of data per flow makes it harder to fully open sender congestion windows. Packet loss is increased due to the non correlated fluctuations of data to be sent between the parallel connections. Two competing flows that are both sending from infinite data sources will quickly adapt to share the bandwidth, but two flows that have a fluctuating demand (e.g. parallel persistent HTTP connections that periodically go idle and alive) will inherently have patterns of underutilizing and overutilizing the path. Overutilization results in either packet loss or excess buffering in the network, which leads to poor interactive response times. When should we open a new parallel connection? The approach HTTP implementations, including firefox, take to solving this quandary? They crudely enforce a constant number of connections per host and open them until they hit that limit. Variously across time that limit has commonly been 2, 4, and 6. As server technology has evolved to the point many years ago where the impact of idleness was a bigger deal than the CPU overhead on the server we saw servers actually publish their resources under several virtual host names, even though it was all the same server, for the exclusive purpose of circumenting that per-host limit in the client. In both cases the first step for a truly low latency request is the same - open a new connection assuming there isn't an idle one available. However, note that establishing that connection is going to take at least 1 RTT for normal HTTP and 2 RTT for HTTPs - so we should actually watch for any existing HTTP transactions to complete on a different reusable persistent connection in between the time we start opening the new connection and the time the handshake is complete. If that happens the persistent connection should be used instead - that will require a change in the current logic where nsHttpConnection opens the sockets after it has been assigned a transaction. Instead nsHttpConnectionMgr should be opening the sockets as well as receiving the returned persistent connections and then should dispatch to them as they become available. In the case of a saturated network some of the existing parallel connections should be stalled while the low latency request is satisfied in order to provide the most bandwidth for that important transaction. We can do this by temporarily slamming their recv windows to something close to 1 packet of data which will slow them down to a trickle. This can be done commensurately with the transmission of the prioritized request as it should take 1/2 RTT for the window change to reach the sender. But what about the more common case where all transactions are of equal priority - how do we make the decision then about opening a new connection vs queueing a new transaction? Assuming we aren't concerned about head of line blocking issues (which we should be able to wrap up in a definition of priorty somehow), then we want to do this only when there is network idleness that can be covered up by parallelism. This approach is radically different than "open up to N" connections. The major difference is that when a transaction in the first scenario decides to open an http connection it always waits for that connection to complete and then dispatches on it. In the second scenario the two actions are taken independently, if another connection frees up before the newly demanded TCP connection is ready we can use that instead (and then cache the connection when it does complete in the pconn pool). It turns out this happens, anecdotally, a whole freaking lot. My test network has a delay of about 250ms between Firefox and each server. Loading the NY Times required 219 TCP connections of which 141 (64%) were able to be served on a different persistent connection that became available between the time we started to open the connection and the time the handshake actually completed. Loading the wall of one of my facebook pals saw this behavior on 9 of 27 connections (33%), and the cnn home page performed similarly to NYT - 76/117 (65%). This makes some intuitive sense - if you have a piece of HTML that includes an img it is entirely likely that we will start the request for the img before we have finished transferring the HTML, but the HTML will finish transferring before the new handshake (which will take a full RTT) completes. This algorithm just moves the request for the img over to the HTML persistent connection which can proceed as soon as the HTML is done. The amount of latency saved is variable - indeed it is probably at least somewhat uniformly random with 0 and RTT as its bounds. I was seeing a mean of around 80ms on each one. Of course this doesn't apply to all transactions - just ones that are opening TCP connections to servers that also do persistent connections. Weirdly, after checking the relevant specs it isn't actually clear to me if the = pad is required. I'm probably missing something obvious. But as this topic generates absolutely 0 google juice, this post is a public service announcement - expect both versions in your clients. As you may know, I've been on a little odyssey to make pipelining safe, fast, and aggressive. I've got a dozen patches for Firefox 4 that do that. You will still need to set network.http.pipelining to true in about:config in order to enable the code. You can also set network.http.pipelining.aggressive to true if you want to disable any of the "gently test the waters" code. I do that when I want to measure the pipelines, but leaving aggressive mode off is probably a good idea if you want to ensure the smoothest experience possible, but I gotta say that the various recovery mechanisms are working well enough (and are used rarely enough) that I am considering making normal mode considerably more like aggressive mode. Consider this a beta level pre-test. I want your feedback and any bug reports. 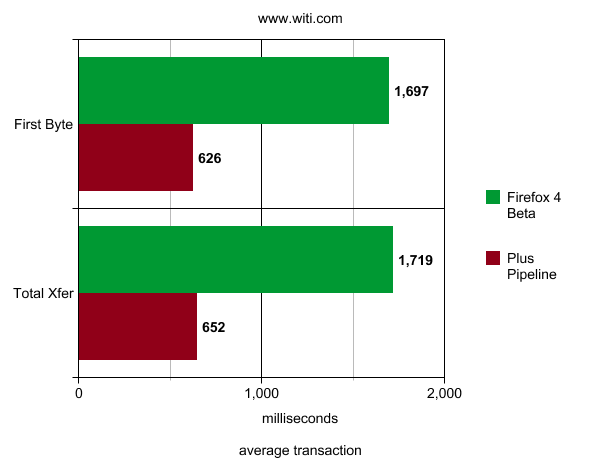 When choosing between more than 1 idle persistent connection FF <= 4.0 goes with a FIFO approach. I was thinking about ways to tune this. I was going to experiment with making that a LIFO. A LIFO afterall should have better cache behavior and would allow the cache size to shrink to a more natural size as the older members remain untouched and timeout. The FIFO will basically keep the size pinned at its maximum while it cycles through all the connections which wastes system RAM with both the client and server maintaining extra idle TCP sessions. It is also the worst possible processor cache behavior. The possible argument in favor of FIFO is actually that connections are expensive to open and we've already opened these so maybe we want to keep it pinned to its maximum size just in case we need it again - it isn't obvious what to do or if it matters much. Thinking a little further I realized that the major differentiator between these sockets is not a timestamp at all - it is the CWND associated with them on the server. Many web servers at least partially ignore the TCP suggestion to return to slow start after an RTO of idle activity so it is reasonable to assume that some of the connections have larger CWNDs than others as long as we aren't in an environment where the previous transfers have been actually bottlenecked by bandwidth - and on the web that almost never happens, RTT and document size bottleneck most transfers. Even if available bandwidth is the real bottleneck that just moots our metric, it doesn't provide any information that steers us the wrong way. When choosing which connection to use we want to choose the one that has the largest CWND on the server. Unfortunately we cannot see directly into the congestion information on the server, but assuming that previous transfers have been bottlenecked by RTT (approximately a constant for all connections to the same server) and transfer size then we can just use the one with the history of moving the largest amount of data in one burst as a proxy for it because that burst is what opens the congestion window. I say one burst instead of one document because we want to include pipelines of multiple HTTP transactions as long as there wasn't an RTT between them. This is another reason to want pipelines - they will more effectively open up the CWND for us. We also want to use the maximum burst seen on the connection, not the necessarily the last burst - the servers we are interested in don't shrink the CWND just because it isn't all being used for each burst. The implementation is easy - the idleconnection list is changed from being sorted as a FIFO to being sorted according to this "maxburst" metric. The code and bugzilla are here. construct a base page mixed with several small and several large images plus a link to a 25KB image. There are 6 objects on the base page. click on the link to the 25KB image - this will use an idle persistent connection. Measure the performance of this load. There is 250ms of RTT and several megabits of bandwidth between the client and server in my test. As expected, vanilla FF 4.0 (beta 9) loads the target image on an idle persistent connection that was used to transfer one of the smallest images on the base page. 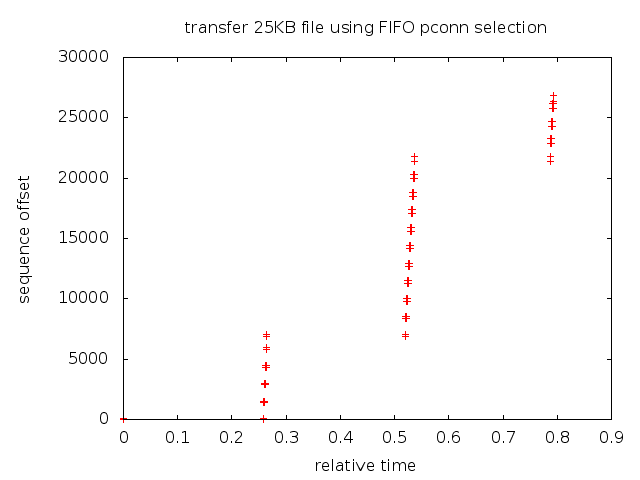 It is FIFO afterall, and the small image load was going to finish first and be put into the persistent connection pool first. 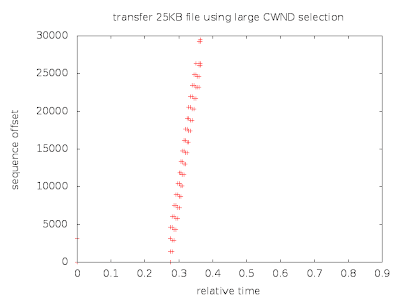 My patched browser, using the sort by CWND algorithm, loads the target image on the idle persistent connection that was used to transfer the largest image (2MB+) from the base page. Their history is the only difference between the two connections - at the time of requesting the 25KB image they are both connected and idle. There is a 250ms RTT between my host and the server. The difference is huge. The default algorithm takes 3 round trips to transfer the document as it works its way through growing the congestion window. That adds up to 793ms. 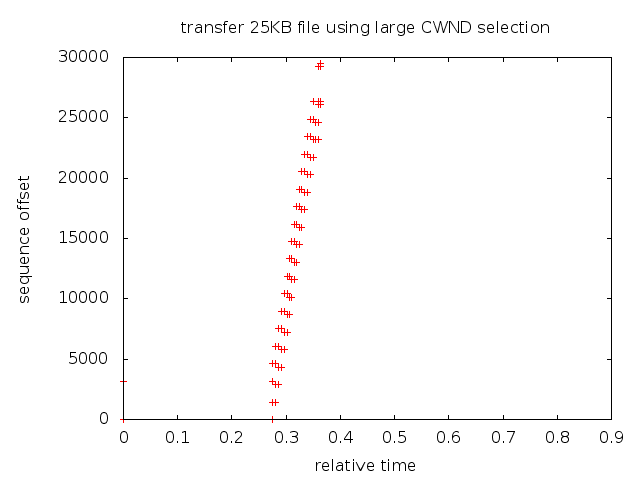 The sort-by-cwnd algorithm inherits a congestion window large enough for the task at hand and moves it all in one stream - just 363ms. This is a nice tweak, but it has its limitations - by definition you cannot meaningfully multiply the gain across a large number of transactions. If you have a large number of transactions then you probably are using all your idle connections in a burst and there is no point in discriminating between them if you are just going to use them all. I would argue if you have that much pressure on the connection pool then you are probably queueing requests and should be using pipelining. If you don't have that much pressure, then this probably helps you.